Florence Yu can't believe her luck. She's starting college the same year New York made tuition free for middle-class students like her. New York's Excelsior Scholarship is the first of its kind. It covers the cost of tuition for qualifying students who are enrolled in a two- or four-year degree program at any of the state's 88 public colleges and university campuses. Plans for the scholarship were announced by Governor Andrew Cuomo in January. At first, students planning to attend college this fall didn't know whether it would become reality in time. It was officially approved by the legislature in April. "I called my Dad at work, and I'm like 'oh my God, Dad, I could get free tuition.' It was so exciting and I remember it so vividly because it was so life changing," Yu said. She's now a freshman at Stony Brook University double majoring in business and health science. Like other students, Yu had to apply for the scholarship and didn't find out until August whether she qualified. The good news finally came, just before it was time to pay the bill. Her parents, immigrants from Myanmar, always wanted her and her brother to go to college, but were worried about finances. "I've never seen my Dad so happy. He knows I really wanted to go to Stony Brook and he was really stressed about paying. Now he's able to, so it really changed a lot," Yu said. When Governor Cuomo announced the program he said that college, like high school, "should always be an option even if you can't afford it." The scholarship could save students as much as $27,000 over four years by cutting out tuition costs. The award doesn't cover fees charged by the school, or room and board. Students must also agree to live in state after college for the same number of years they received the scholarship, or it will be converted to a loan. 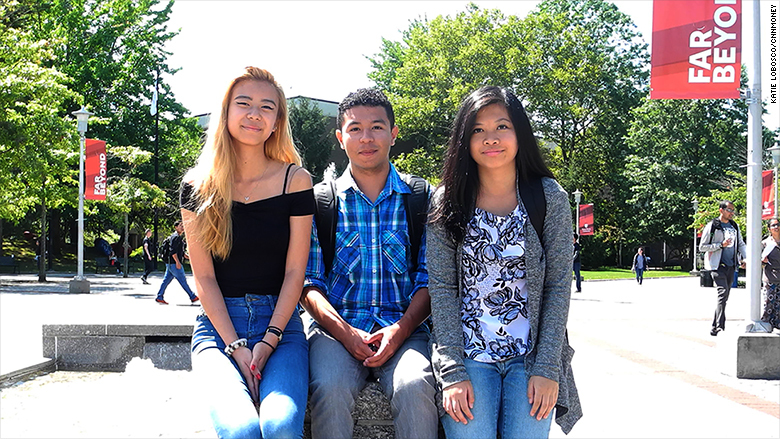 Stony Brook University freshmen Florence Yu (from left), Tyler Mendoza, and Bonnie Tang received the Exelsior Scholarship. Bonnie Tang, another Stony Brook freshman, is commuting from her home in Brooklyn, saving her about $13,000 in room and board costs. She'll have to buy a monthly train pass. And she'll still pay about $2,560 in fees this year. But everything else is free. "My tuition is paid for and that saves me a lot of money," she said. Tyler Mendoza, also a freshman at Stony Brook, and James Martello, a freshman at the University at Albany, both say they probably would have gone to a community college instead if they hadn't received the Excelsior Scholarship. Gianluca Russo transferred to the University at Albany this year after finishing his associate's degree from Schenectady County Community College. The scholarship, he said, convinced him to stay in state to pursue a bachelor's in journalism. 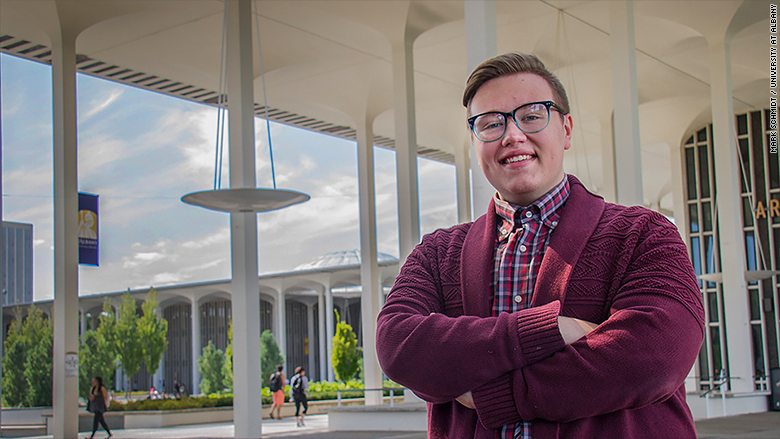 Gianluca Russo said the scholarship allowed him to transfer to the University at Albany. He might have gone out of state otherwise. An estimated 75,000 people applied for the scholarship this year, but an initial projection from the governor's office said only about 23,000 would receive it. An official number has yet to be released as summer course credits are counted and community college students continue to enroll for the fall semester. Officials from several schools said the biggest reason why students were disqualified was because they receive other need-based grants that already cover the full cost of tuition. The Excelsior Scholarship doesn't offer additional funds to help with other expenses. 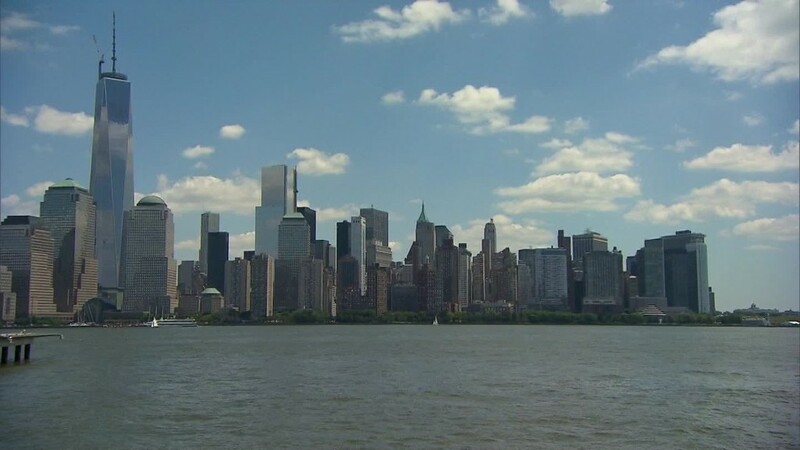 "While many students with the greatest financial aid have always attended CUNY tuition-free, far too many families just above the income eligibility -- which means most middle class families -- received little or no state or federal aid," said CUNY Chancellor James B. Milliken in a statement emailed to CNNMoney. The Excelsior Scholarship will "help remedy this problem," he said. Income isn't the only eligibility requirement. Students must be a state resident and they must maintain a full time schedule. That disqualifies many community college students going to school while working. It also makes it tough for adults wanting to return to school to finish a degree they started years ago. Ahmad James, 35, is one of those students. He has stopped and started college twice. Once because two deaths in the family required him to help out at home, and once because of Hurricane Sandy, which forced him out of his apartment. He found a new place in Long Island, but it extended his commute to work and didn't leave time for class. But after he applied for the Excelsior Scholarship, he was told he was ineligible because he "did not earn a sufficient number of credits in each year" he was previously enrolled. The program requires you to take an average of 30 credits a year. Ahmad James was surprised to learn he didn't qualify for the scholarship because he didn't take enough credits in previous years. 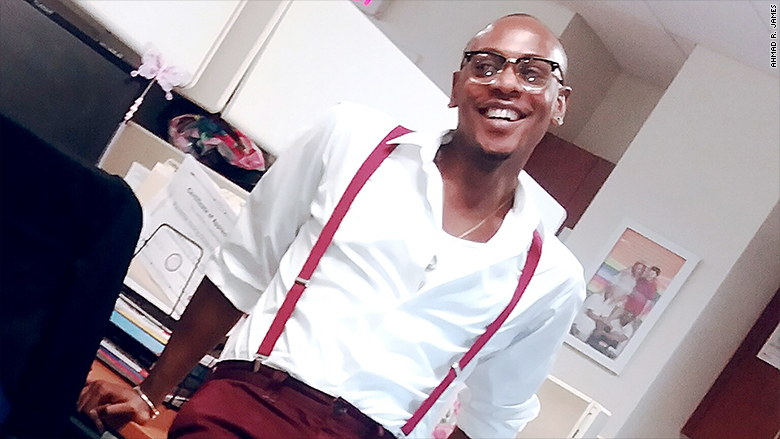 He's working on finding other ways to help pay for college so he can advance his career in social services. "I have the experience, but I need the piece of paper to do exactly what I want to do with my life," James said. It's too early to tell the impact the scholarship will have on New York's college campuses. Many incoming freshmen had to enroll before officially being awarded the scholarship. Transfer students, though, were more likely to find out about the scholarship before making their decision. The University at Albany saw an 11% jump in applications from transfer students this year, which officials attribute at least in part to the Excelsior Scholarship. "It's creating a very positive buzz about public higher ed," said Stony Brook President Samuel Stanley. "If you go around the country the story has generally been states pulling back on support of higher education, putting more of the burden on students and their families. So this is really changing that narrative in a very dramatic way," he said.